This is a fun animal game in which you will play with three sheep. Each one has some unique capabilities, the fat one can smash stuff, the small one can fit through many small gaps and the middle one is very athletic. Have lots of fun with them trying to collect all the socks for the extra score. Also many achievements are waiting for you to be uncovered. Shirley, Shaun and Timmy are eager to reach their destinations and it is up to you to figure out how to take them all to that hard to reach spot. Push trampolines strategically to jump off them, clear paths of hay and many other key actions to clear your way. 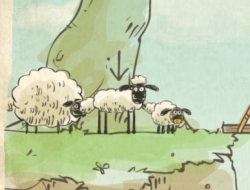 Use the arrow keys to control the sheep and 1, 2, 3 to change the sheep. Home Sheep Home 10.00 between 0 and 10 based on 1 votes.